Heat 6: Dimension were back in the game after some repairs and held a lead up the first work of heat 6. Garde were forced to do a penalty turn after a run in with Dimension which saw them lose time on the leader. Dimension rounded the top mark first, followed by Skoll, LCC, Garde and Gemmell all close, with Geotherm in 6th. Down the run, Dimension opened a nice lead while LCC capsized at the bottom mark. Garde briefly crossed Skoll before over shooting the bottom mark allowing Skoll back in, and then capsizing whilst trying to round it. Gemmell and Geotherm rounded next. Dimenion and Skoll were comfortably 1st and 2nd respectively up the next work, LCC made a charge to pull back in front of Garde and hold 3rd place. The two skiffs were neck and neck down the second spinnaker run to Chowder. LCC were forced to jibe early to give Garde room for water as the shore line was fast approaching, they capsized during their rushed jibe. This allowed Garde some breathing space to hold 3rd place to the finish, with Skoll remaining 2nd and Dimension 1st. The final results saw Dimension win their 3rd consecutive State Championship, with Garde 2nd , and Skoll 3rd. Geotherm picked up the Handciap from Skoll, both for their consistent improvements through the first half of the season. The full list of the final standings can be downloaded here. 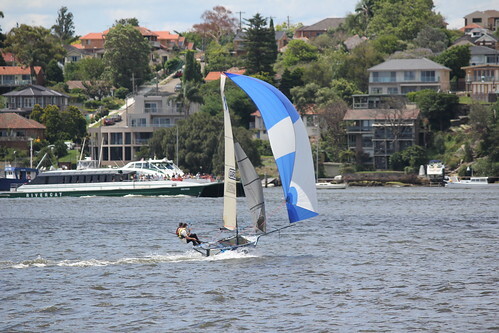 Many thanks to Lincoln Crowne for their support of the event, and all the volunteers at Lane Cove, Abbotsford and Woollahra Sailing Clubs for their help and all they had to endure through 4 days of intense racing. 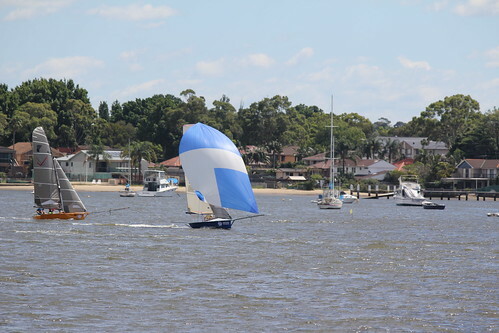 Heat 5: A fresh southerly wind blasted across the harbour, and all skiffs went with their smallest rigs. 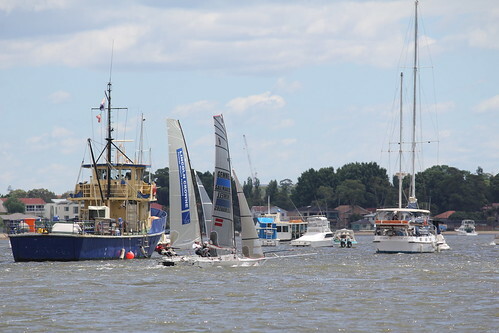 Garde, Gemmell and Skoll tussled it out at the front of the fleet up the first work, while championship leader Dimension were seen on their side back off the start line affecting some repairs. It was later revealed that the jib down haul had broken. 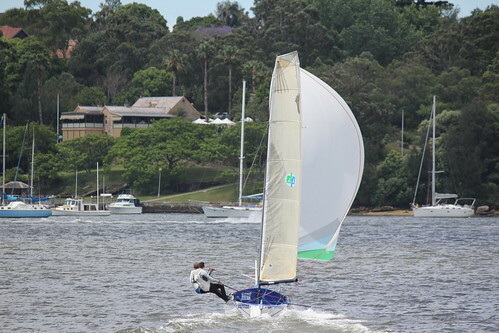 Garde got the jump at the top mark rounding, and took off down the long spinnaker run to chowder bay. Second around the top mark was Skoll, then Gemmell and closely followed by Geotherm. Geotherm had a great run to the bottom mark to round in second place just ahead of Skoll. Skoll would get back to 2nd after a quick swim by Geotherm up the next work. Garde held a comfortable lead for the next lap and a half of the race and went on for the win with Skoll picking up 2nd and Gemmell sneaking in front of Geotherm for 3rd. Heat 4: There was some debate on the rig choice with the breeze seeming to bend around to the NE, with an easterly forecast of 15 knots. Most skiffs opted for 2nd rig with some going with big. 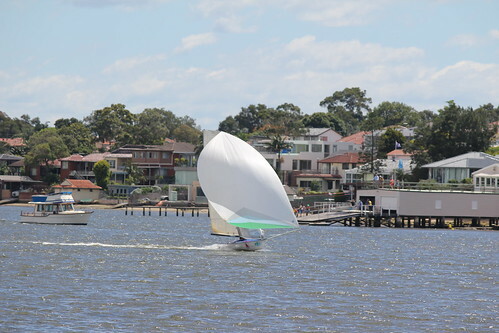 Dimension Polyant were one such skiff and sailed an exceptional race with the big gear up to take victory by 4 seconds from Garde. Gemmell Sails finished 3rd with Skoll picking up 4th. Off the start line all skiffs remained close and headed to the left side of the course, Dimension holding a slender lead from PB Towage (on tour with some other crews from QLD) and Skoll and LCC. Dimension rounded the top mark first by a few seconds to PB, LCC and Garde, the latter sneaking inside LCC for the kite set, and soon passed PB who had some spinnaker issues. 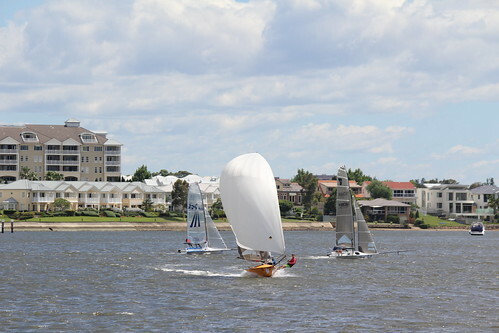 Dimension pulled away around Shark Island under their big spinnaker, while Garde, LCC and Skoll rounded simultaneously. Garde held the inside line to hold second place, with all 3 skiffs making up time on Dimension who, being first, had the joy of finding the bottom mark in the setting sun. The breeze kicked a little and allowed Garde to gain on Dimension, they would get their noses in front for a brief moment, with both skiffs ducking transoms for several tacks. Gemmell Sails made a charge up the fleet to move into third place, but it was Dimension who round the top mark first again. And again they pulled away down the square run, while Gemmell fought with Garde, crossing them momentarily for 2nd place. Up the final work, Garde went right while Dimension went left initially, and gained some time to first place, and down the final run Garde closed the gap right up to only finish 4 seconds in arrears. Geotherm won the handicap for their stellar effort of 6th place and only 1 min behind. Heat 3: D-Unit (Adam Forbes and Richard Johns) got the best of the Start tacking onto port early and working the Northern shore whilst the majority of the fleet headed to far south into limited pressure and pushing against a strong run out tide. 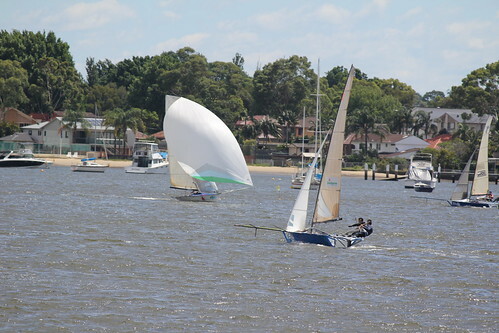 Dimension Polyant (Nick Press and Brad Yabsley) and Gemmell Sails (Murray Press and Ben Faulkner) were the best of the rest despite Gemmell sails attempting to board the Start boat. At the top mark D-Unit held a small lead after showing some great boat speed in the softening breeze. 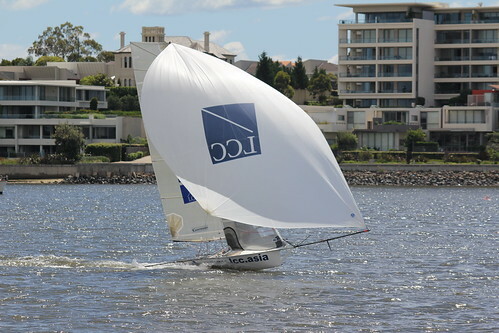 Dimension Polyant was around next with the pack including Gemmell Sails, Garde (Brett Hobson & Alex Johnson), Vantage Real Estate (Jack Winning and Brett Phillips) and Lincoln Crowne (Jonathon Temple and Richard Jones) in hot pursuit. With building pressure Dimension managed to sneak past D-Unit by the bottom mark and hold a 20m lead heading on the long work to Putney. In the fading breeze D-Unit closed in on and overtook Dimension to take 50m lead at the top mark only to see Dimension Polyant slide back through under spinnaker. By this stage the two leading boats had opened up a huge margin over Gemmell Sails who was comfortably positioned in 3rd ahead of the chasing bunch. Heat 2: Dimension Polyant jumped to the top of the leader board on Sunday, with two wins from two starts. It was another testing day for all crews with the breeze oscillating from North West to South West, and strength ranging from 5-18knots. Dimension got out to an early lead in heat 2 closly followed by Garde. Lincoln Crown made a charge through the fleet, passing both Garde and Dimension to hit the lead up the second work. LCC extended their lead down the next kite run and looked set to record a great come from behind victory, until gear failure saw them capsize near the final bottom mark. 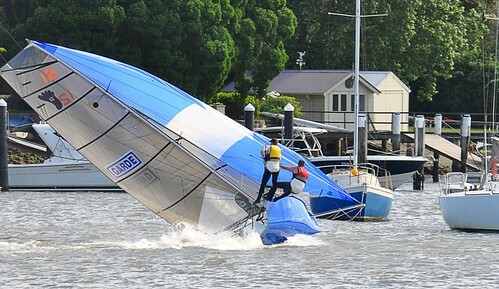 The breakage was related to their spinnaker system and meant they couldnt reset. They were forced to limp home down the last kite run, leave Dimension to take line honurs. However LCC managed to hold onto second place by a few seconds from Garde who ran out of time to run down LCC. 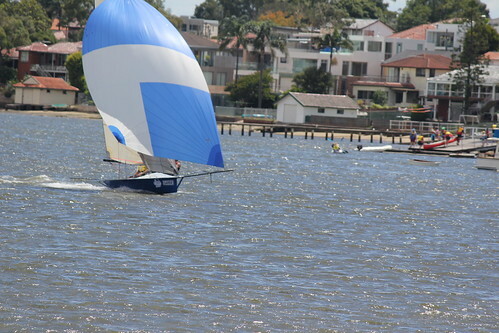 Heat 1: Skoll (Peter Polec & Jamie McCruden) sailed a steady and consistent race to take heat 1 of the Lincoln Crown State Championships at Lane Cove. It was a tough day for all as the breeze continued to build soon after the start. Gemmell Sails held a good lead for the majority of the race, only surrendering it breifly to Garde who would capsize soon after getting their nose in front. Gemmell appear to be untouchable from there, however their lead was perminently taken away when their mast broke with only half a lap of the race to go. Lincoln Crowne found themselves at the head of the fleet and would go on to cross the finish line first, but would later be ruled OCS. Garde were running behind Lincoln for most of the race, though Skoll got in front of them breifly in the middle of the race, before being over taken again. Dimension Polyant were charging through the fleet after restarting, but had a few swims and some rigging issues which kept them behind Skoll. Down the final run into the river, it was looking like Garde would get there over Skoll, however Garde got a little too close to the moored yachts, got blown in on a heavy gust and capsize amoungst them. This allowed Skoll to sneak past again to take the win. It is a great win for Peter as it was in this same event and location almost a year ago to the day that his old boat was tragically run over by a tall ship. Peter and Jamie worked hard to ge their new boat on the water, and they received their reward today. This entry was posted in Race Reports and tagged Woollahra on November 27, 2011 by Karmen.